I've been getting a ton of emails asking about our Christmas stockings from the Better Homes & Gardens shoot. I know Lara is totally backed up before Christmas but if you can wait, it's so worth it!! Thanks Lauren! The etsy shop is fabulous! I think I am going to have to pull a "copy-cat" move and grab a pair before christmas! I love the stockings!!!! 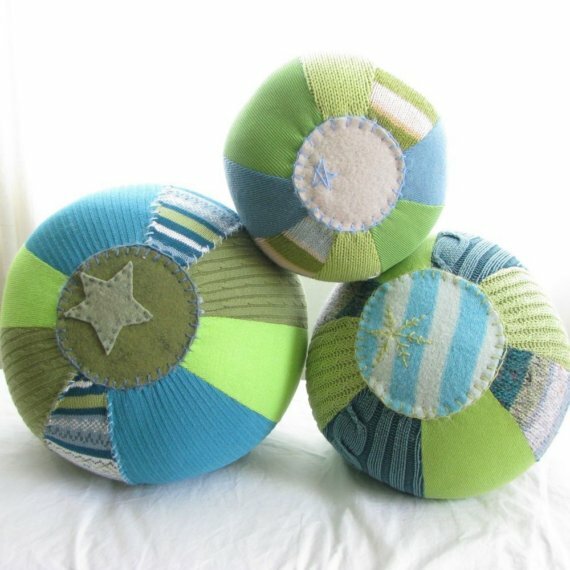 And the sweater balls look like such fun; I know my son and my cat would love them! haha! Love your little cutie in the pic too. I love your blog and your work is great. the Thanksgiving things. Your Boy is so cute in those jammies. Very cute items. Everything looks great. I could eat your mantle up! A ton of talent all wrapped up in one photo! Georgeous, and I am a Huge fan of green myself! She is so talented! Love the colors. Adore the stockings! Actually, I adore it all! I just LOVE your mantel!!! Dear Lauren, Please send a pair of socks, balls and that amazing convex mirror to 5500 Columbia Pike. In return we'll play dress up and I'll give you a big lasagna, a big glass of wine and a big kiss...not necessarily in that order. The stockings are adorable and the sweater balls are so clever! The texture is so pretty and the colors - Love 'em. Oh, i haven't dived into my issue yet - so wonderful that you and your family are highlighted inside. Those stockings are fab and look worth the wait! It all looks amazing. I am in love with those felt ornaments!